May has not one but two bank holidays (public holidays) so we can enjoy more free time this month. The Early May Bank Holiday is on Monday 6 May and the Spring Bank Holiday is on Monday 27 May 2019. London Wine Week (13-19 May 2019) will be celebrated in lots of locations in the London Bridge area as well as across London. The Regent’s Park Open Air Theatre 2019 season starts this month with ‘Our Town’ by Thornton Wilder. And on the second Sunday in May (12 May 2019) it’s the Covent Garden May Fayre and Puppet Festival. There’s a procession at 11am from St Paul’s Church in Covent Garden returning for the Church service at midday, followed by Punch and Judy performances from 12.30pm onwards. Following a sold-out run at the National Theatre last summer, the NT and Neal Street Productions’ critically acclaimed The Lehman Trilogy is transferring to the Piccadilly Theatre. Performances start from 11 May for a limited 12-week season (opening night is 22 May 2019). The Lehman Trilogy is by Stefano Massini, adapted by Ben Power and directed by Sam Mendes. Simon Russell Beale, Adam Godley, and Ben Miles are reprising their roles as the Lehman brothers, their sons and grandsons. It’s the story of a family and a company that changed the world, told in three parts on a single evening. On a cold September morning in 1844, a young man from Bavaria stands on a New York dockside. Dreaming of a new life in the new world. He is joined by his two brothers and an American epic begins. 163 years later, the firm they establish – Lehman Brothers – spectacularly collapses into bankruptcy, and triggers the largest financial crisis in history. Also on from 11 May, but this time at the National Theatre, is ANNA – a ground-breaking new sonic collaboration created by Ella Hickson and Ben and Max Ringham. Anna and Hans are married, in love and moving up in the world – but it is a world ruled by suspicion. Can we ever escape our past? This headphone-based sound thriller will give the audience intimate access to communist East Berlin. Set over one night in 1968, a promising young couple have their love tested by increasing pressure from the state. When crimes of the past and the present blur, who can be trusted? Everyone is listening. The RA Festival of Ideas is back for a second year from 2 to 6 May 2019 with a raft of inspiring speakers – from artist Grayson Perry and children’s author Dame Jacqueline Wilson to the Artistic Director of the Young Vic Kwame Kwei-Armah. 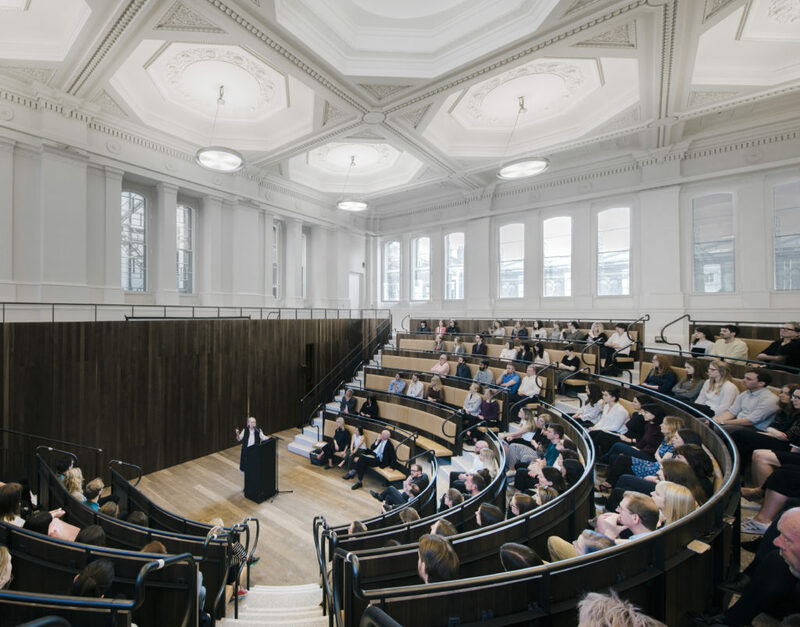 It brings together great minds in art, literature, film, dance and music for six days of electric discussion, debate and creative thinking in the Royal Academy’s Benjamin West Lecture Theatre. Royal Academician Grayson Perry is in conversation with his wife psychotherapist and author Philippa Perry, and you can also hear from film director Ken Loach, choreographer Hofesh Shechter, fashion designer Sir Paul Smith and ‘Pet Shop Boy’ Neil Tennant. All will discuss their creative practice and share ideas on current cultural, social and political themes. Building on the RA’s heritage of rigorous debate, the festival explores culture, creativity and critical thinking through a series of interviews, conversations and panel discussions, as well as family workshops too. Museum of the Moon is a large-scale touring artwork by UK artist Luke Jerram. And you can see it at the Natural History Museum from 17 May to 8 September 2019. 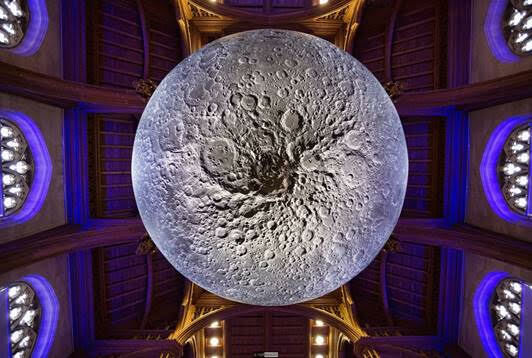 The six-metre spherical sculpture features detailed, high-resolution NASA imagery of the lunar surface, accompanied by a surround-sound composition by Dan Jones, offering visitors a new and exciting perspective of the Earth’s celestial neighbour. Displayed to coincide with the 50th anniversary of the Apollo 11 Moon landing (20 July), Museum of the Moon is open to all ages and free to visit. For more information about this globally touring artwork go to www.my-moon.org. Join interactive theatre-makers Coney in Companion: Moon, a free experience where you can join in or observe as multiple art forms combine. There are also yoga classes under the Moon planned, plus reiki drumming and guided meditation. The Royal Observatory is also commemorating the Apollo 11 Moon landing 50th anniversary with ‘Marvellous Moons’ from 25 May 2019. We can discover more about the moons of the Solar System in this amazing photographic exhibition. From our familiar Moon to the lava world of Io or toxic lakes on Titan, this exhibition showcases the fantastic variety of planetary moons in our Solar System. 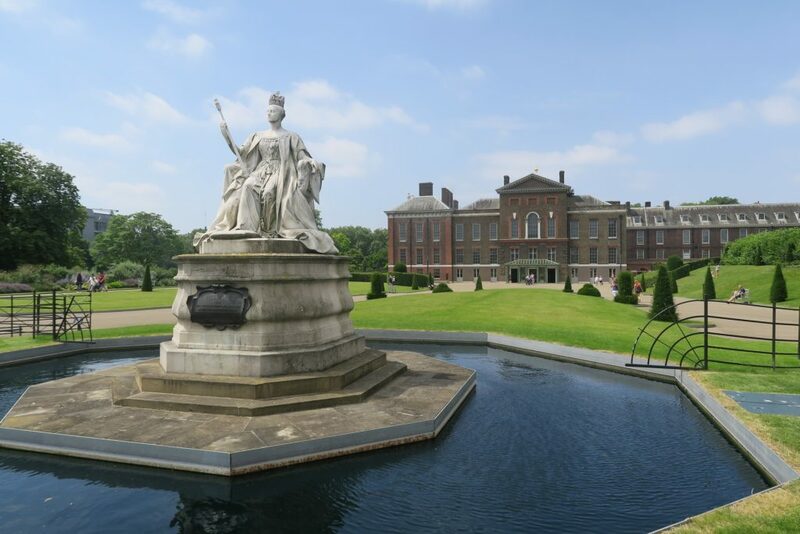 May marks the 200th anniversary of Queen Victoria’s birth at Kensington Palace so this is a great time to visit as the Palace is challenging expectations of this famously ‘unamused’ monarch. Opening on 24 May 2019, Queen Victoria’s birthday, Victoria 2019 has two new exhibitions to see (both included in Kensington Palace admission). Victoria: A Royal Childhood examines Victoria’s early years spent at Kensington, with the suite of rooms she and her mother occupied being reimagined in an evocative and family-friendly exploration of royal childhood. In the Pigott Gallery, Victoria: Woman and Crown considers the private woman behind the public monarch and re-examines her later life and legacy. Also, this month, visitors to Kensington Palace will be treated to How Drink Shaped Society talks by food historians uncovering how the unlikely trio of tea, coffee and chocolate have shaped society. From their impact on the stock exchange to literature and even fashion. The talks are drop-in sessions and take place in the palace’s opulent State Apartments on 4, 5, 11, 12, 18 and 19 May 2019. 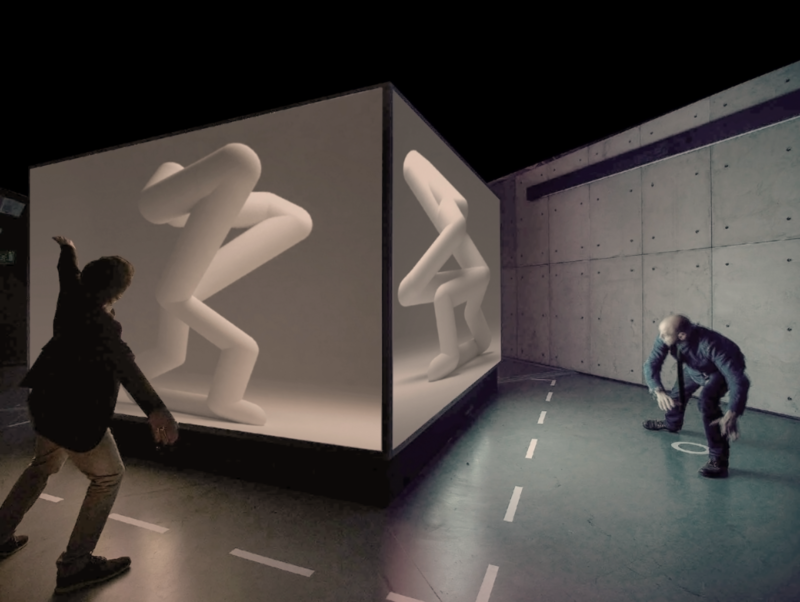 AI: More Than Human is a major new exhibition at the Barbican Centre from 16 May to 26 August 2019. It is an unprecedented survey of creative and scientific developments in Artificial Intelligence, exploring the evolution of the relationship between humans and technology. There are new commissions and projects by artists, researchers and scientists Joy Buolamwini, Stephanie Dinkins, Mario Klingemann, Kode 9, Lawrence Lek, Massive Attack, Lauren McCarthy, Yoichi Ochiai, Neri Oxman, Anna Ridler, Chris Salter, Sam Twidale and Marija Avramovic, and Universal Everything. And it’s the Sound Unbound festival of music on 18-19 May 2019. This ambitious weekend-long project celebrates classical music from the medieval era to the present day. And, for the first time, it is completely free. 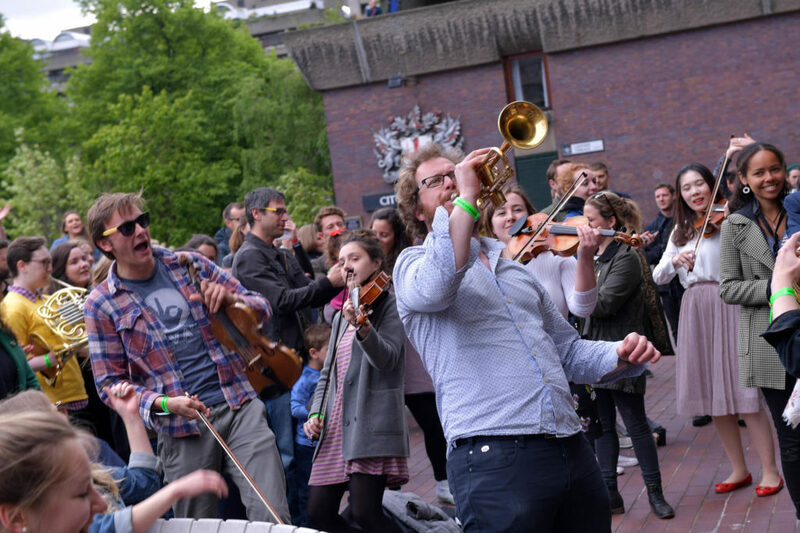 The festival explores unexpected spaces across Culture Mile, which stretches from Farringdon to Moorgate in the north-west of the Square Mile, celebrating fantastic music alongside the history and heritage of the area. 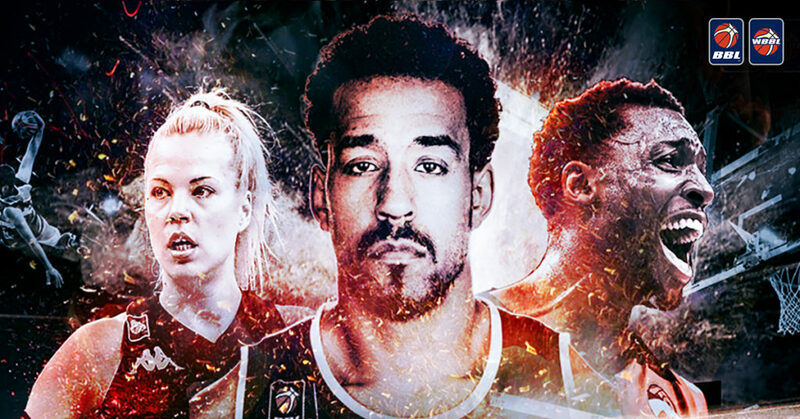 The 2019 British Basketball Play-Off Finals take place on Sunday 19 May 2019 and will be a landmark edition; the fifth to be held at one of the world’s leading arenas for basketball, The O2. Opening on 24 May 2019, Leonardo da Vinci: A Life in Drawing is at The Queen’s Gallery, Buckingham Palace. To mark the 500th anniversary of the death of Leonardo da Vinci, over 200 sheets of the Renaissance master’s greatest drawings in the Royal Collection are going on display to produce the largest exhibition of Leonardo’s work in over 65 years. 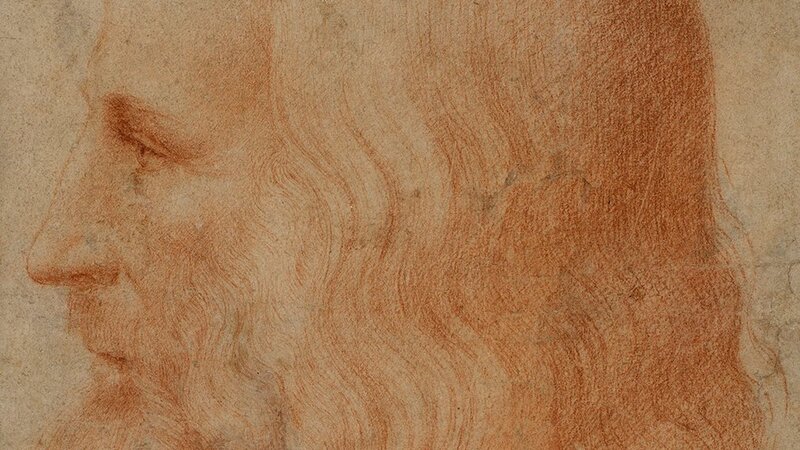 The drawings have been together as a group since the artist’s death and provide an unparalleled insight into Leonardo’s investigations and the workings of his mind. If you would like even more ideas for this month, do have a look at last month’s recommendations as many are still valid for May too. One of the biggest and most profound mysteries in contemporary physics today is what exactly makes up our Universe, and why 95 per cent of it is seemingly missing. The Dark Matter season at the Science Gallery London opens on 6 June 2019 and will examine the fundamental nature of reality and attempt to make sense of what we deem to be ‘real’. A Midsummer Night’s Dream is at the Bridge Theatre from 3 June to 31 August 2019. The theatre becomes the forest – a dream world of flying fairies, contagious fogs and moonlight revels. While the seating is wrapped around the action, immersive tickets allow the story to be followed on foot. The production reunites the creative team responsible for last year’s smash-hit Julius Caesar. And The Royal Opera House BP Big Screens return in summer 2019 with three opera and ballet performances screened live and for free at several locations across the UK, including Trafalgar Square. The titles can be seen here and there will be more details on the ROH website soon. Laura Porter writes AboutLondonLaura.com and contributes to many other publications while maintaining an impressive afternoon tea addiction. You can find Laura on Twitter as @AboutLondon, on Instagram as @AboutLondon and on Facebook as @AboutLondonLaura.